I can't believe today's the last day of July! This has been a really great month for me fitness-wise. Thanks to following the Blogilates July calendar and throwing in The Betty Rocker 30-day challenge, I've been more consistent with working out than ever before. Click here to download a PDF version of the calendar. I based this on the Blogilates calendar, but added an extra cardio day and moved the rest day to better fit my schedule. I'll decide on the exact workouts to do week by week. Here's a look at some of my favorite (all FREE) routines in each category, as well as my schedule for this week. High intensity interval training (HIIT) is probably my favorite type of exercise. Here are some great examples. 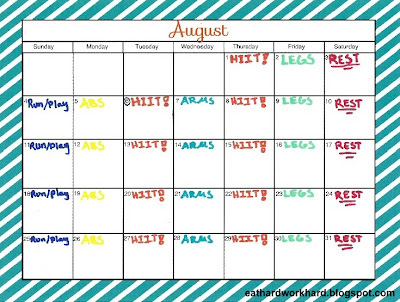 Q: Do you have a monthly or weekly schedule for your workouts? Have any tips or tools? Since I wanted to experiment with coconut flour baking, this week’s grab and go breakfast is zucchini banana coconut flour muffins. At 92 calories a muffin, 2 muffins topped with 2 tablespoons of natural nut butter with a side of almond milk makes the perfect balanced breakfast to start your day. This week, I decided to make my slow cooker shredded chicken again. I love this recipe because it is really easy and there is almost no active cooking, perfect for when I am busy (or lazy). It’s also extremely versatile, which means I never get sick of eating it before the week is over. 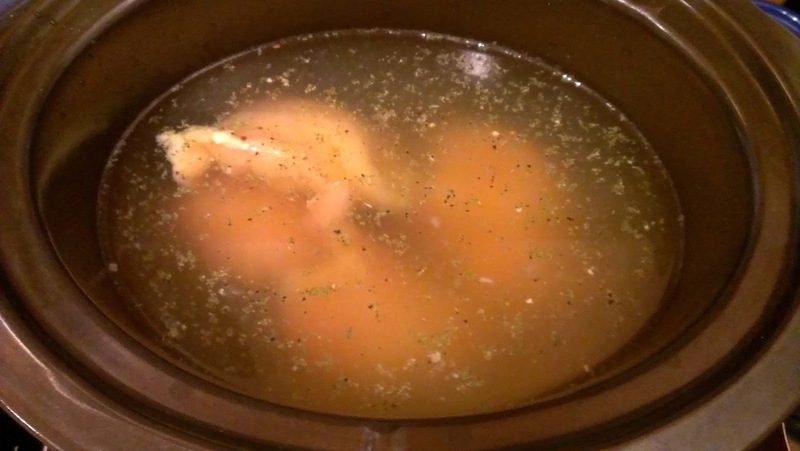 All you have to do is dump 4 boneless skinless chicken breasts (I’ve been using frozen since they were unbelievably cheap on sale at Target) into your slow cooker, cover with chicken or vegetable broth, and throw in any spices you like (I used Mrs. Dash original this time). Pretty unappetizing looking, but after 8 hours on low you will end up with moist, delicious, and yummy chicken that you can use to make an almost infinite number of healthy meals. 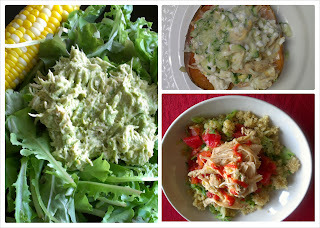 Here are a few of my favorites: Mixed with avocado on top of greens for a healthy chicken salad salad, mixed with cottage cheese and Greek yogurt for a creamy sweet potato topping, and topped with sriracha over quinoa and diced tomatoes and chilies for a healthy take on a spicy mexican bowl. I baked more sweet potatoes since I am still (somehow) not sick of them. 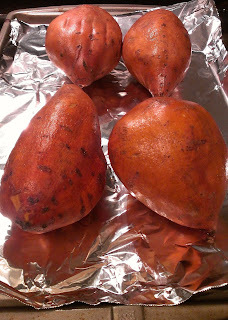 Only baked four since I did my grocery shopping at Target and all their sweet potatoes were gigantic. 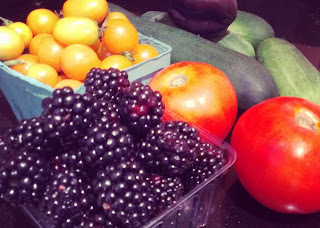 I made an impromptu stop at our local farmer’s market and loaded up on produce for the week. The blackberries and tomatoes were especially yummy. Those little orange tomatoes are pure heaven! Q: How was your weekend? Have any meal prep tips and tricks to share? I am not gluten intolerant, but I love seeing all the creative gluten free recipes out there (that tend to also be lower in calories!). 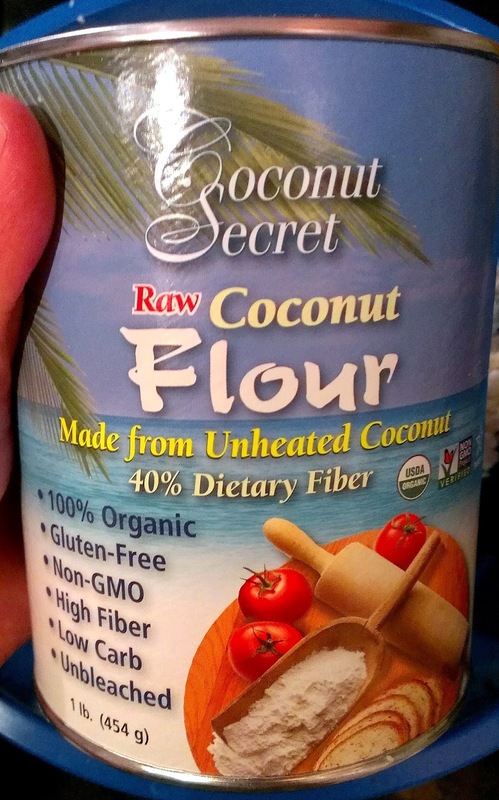 This weekend, I had the urge to bake something and decided to try out the newest flour substitute I've seen all over the internet lately: coconut flour. 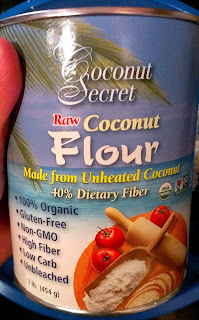 Coconut flour is made from ground coconut meat. It is gluten and grain free, extremely low in carbs, high in fiber, and lower in calories than many flours. The flour I used (which I found at Whole Foods) had 248 calories, 14 g of protein, and a whopping 24 g of fiber in 1/2 cup, versus 278 calories, 8 g of protein and only 3 g of fiber in 1/2 cup of white flour. While nutritious, coconut flour can be tricky to work with as it absorbs a lot of moisture. For the best results, coconut flour requires an equal ratio of liquid to flour, so it works the best in recipes that have a lot of wet ingredients. Mix dry ingredients (coconut flour through salt) together in a large mixing bowl. In a separate bowl, whisk the eggs, then mix in the rest of the wet ingredients (through vanilla extract). 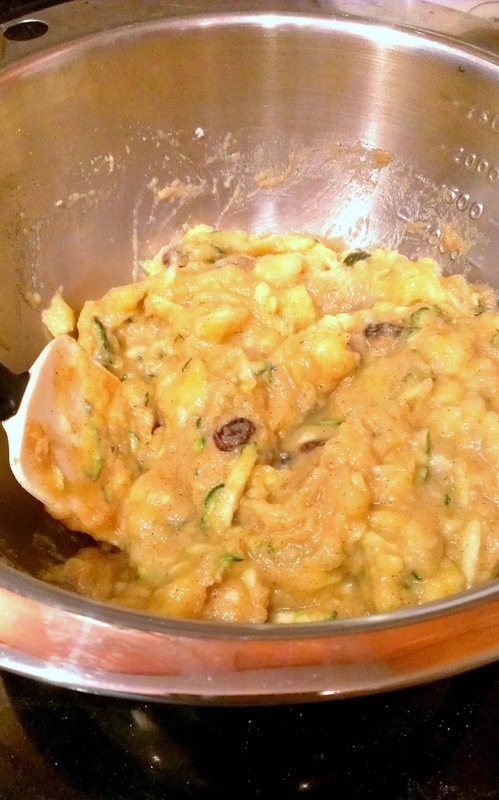 Fold in the wet ingredients to the dry ingredients and mix until well combined, then mix in the zucchini and the mashed banana. The batter will be fairly wet and a little chunky. Pour into a greased muffin pan and bake for about 25 minutes at 350 degrees, or until the muffins are brown around the edges and seem firm in the middle. These came out really well! The coconut flour definitely has a different texture, but the muffins were light, moist, and sweet but not to sweet. The only thing I would do differently is to add walnuts to up the protein and add a nice crunch. I actually planned to use walnuts this time, but had a less than 1/4 cup left and couldn't find the mythical second bag I bought. #bloggerfail These are a great snack and 2 muffins (at only 92 calories each!) topped with peanut butter would make a nutrition-filled delicious breakfast. Q: What's your favorite flour substitute? 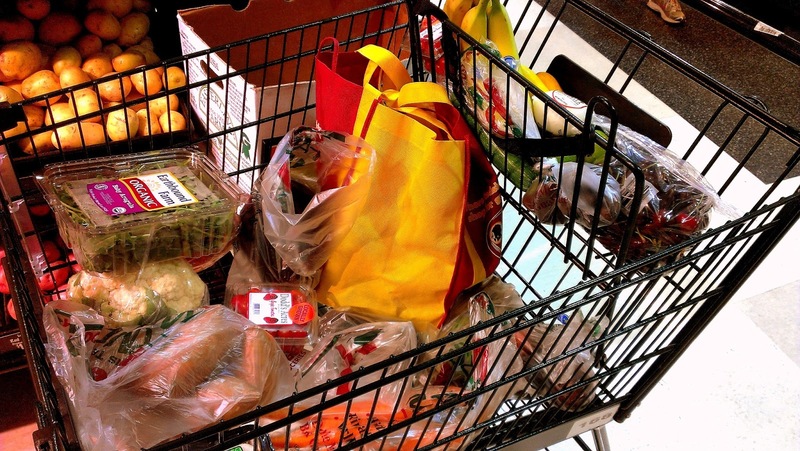 Are you going gluten free? Happy Friday! 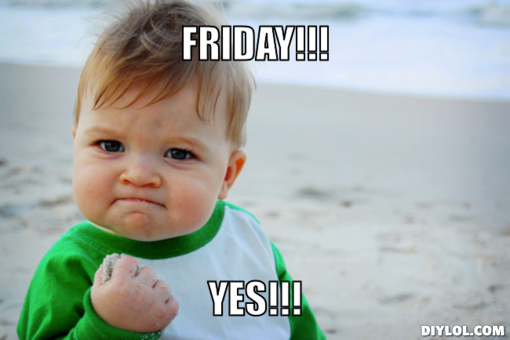 This week seems like it has lasted forever, and I don't know about you but I am so looking forward to the weekend. 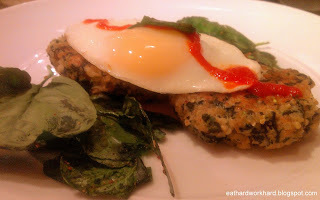 For today's skinny and delicious recipe, I wanted to make something easy using the food I already had in the fridge. 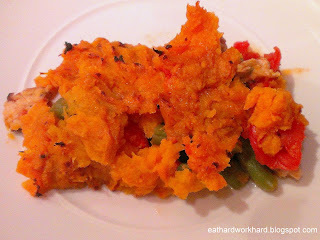 So when I saw this lightened up version of shepherd's pie from Fit Fun and Fantastic I knew it was the perfect meal to adapt to use up the rest of my turkey meatloaf muffins and baked sweet potatoes. I love shepherd's pie. Those creamy mashed potatoes that have gotten a glorious crispy crust in the oven, layered on top of some saucy meat and vegetables just screams comfort food. However, it's not the healthiest thing ever, especially when you eat the entire pie, which I always do. 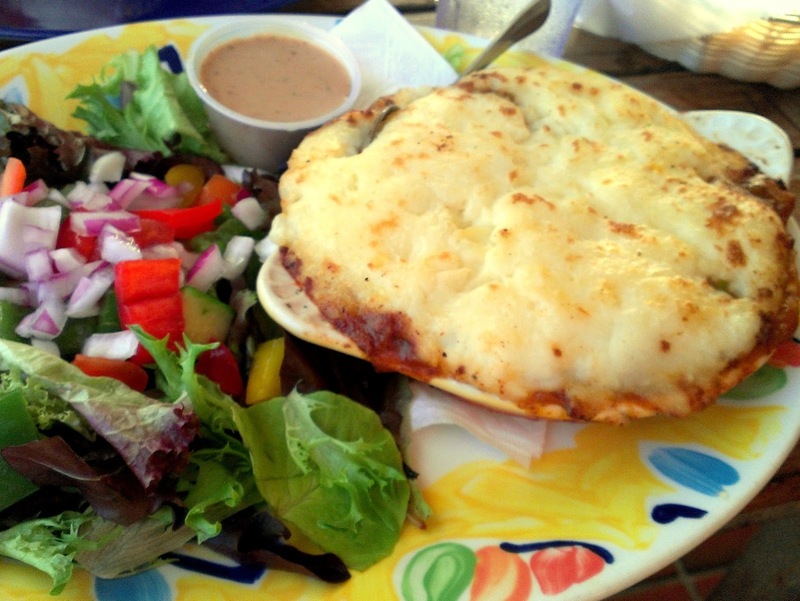 Witness this yummy example from an English-style pub on a recent Bermuda vacation. 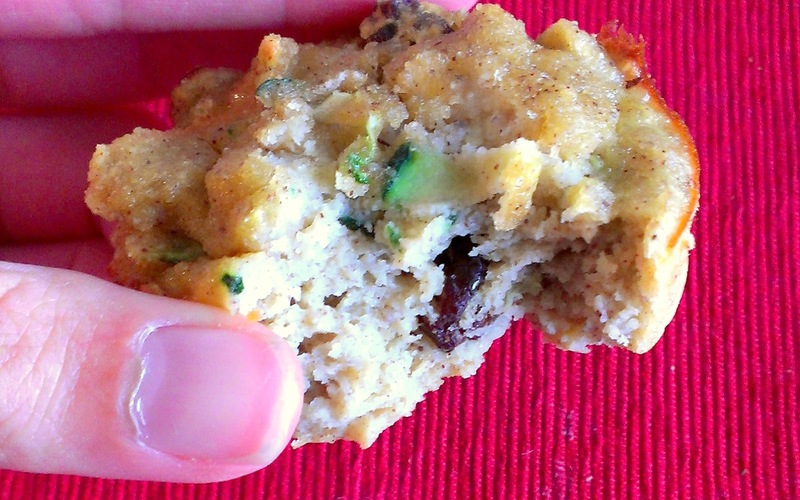 This version lightens up the original by subbing sweet potatoes for regular potatoes and subbing crumbled turkey meatloaf muffins for the traditional lamb or beef filling. And, while it definitely tastes healthier, there is still plenty of oozy comfort in this pie. 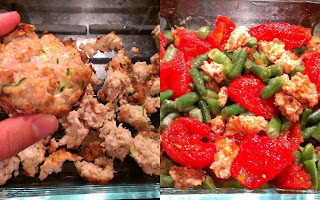 Crumble the turkey meatloaf muffins in the bottoms of a greased 8x6 or 8x8 pan, then stir in the green beans, stewed tomatoes, and worcestershire sauce. 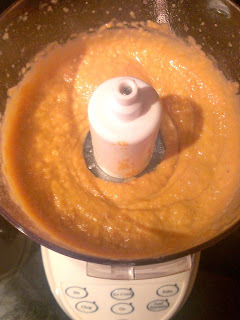 Next, mash up the sweet potatoes and spread on top of the mixture. 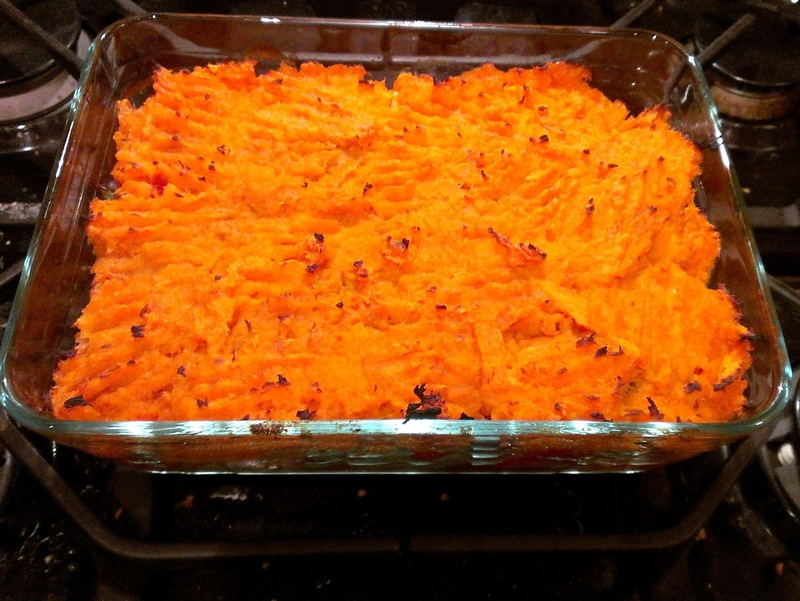 Bake for about 30 minutes, then broil for about 5 minutes or until the top is browned and crispy. Cut into 6 squares and serve. 1 serving is 2 squares, or 1/3 of the recipe. I loved how this recipe came out and plan on making again in much larger quantities! 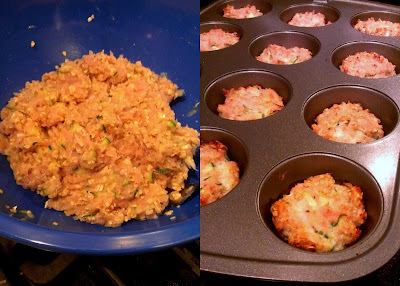 The oats and zucchini in the muffins added a lot of great texture, but if you don't have a bunch of leftover turkey meatloaf muffins, check out Fit Fun and Fantastic's version for instructions using ground turkey. Q: What are your favorite comfort foods? Found any good light versions, or does only the original do it for you? 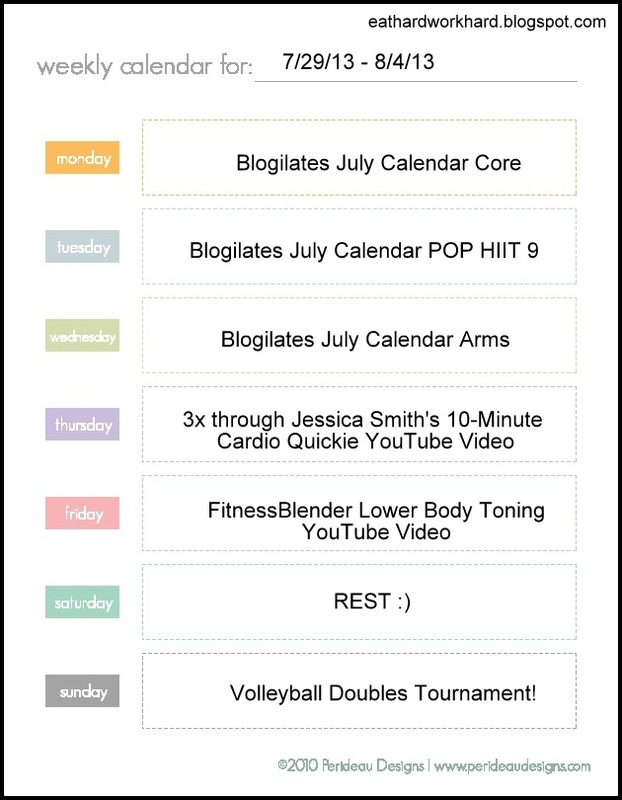 Last week, I talked about my experience following the Blogilates July workout calendar. For this week's workout Wednesday, I wanted to give you a brief look at my other monthly commitment, The Betty Rocker 30-Day Bodyweight Shred Challenge. When I was figuring out my workout plan for July, I was really focused on weight loss and winning my DietBet (only 13 days left! wish me luck!). 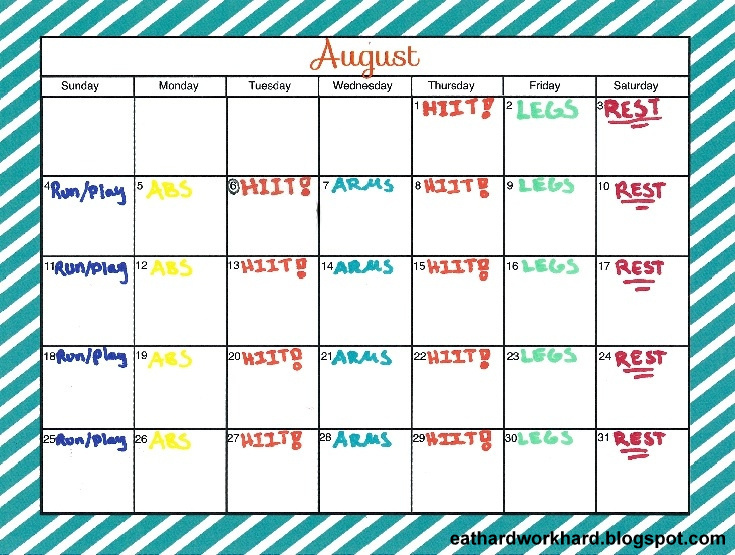 After deciding to commit to the Blogilates July workout calendar, I was worried about meeting my goals with only two cardio days a week. I am also a BIG fan of high intensity interval training (hiit) and so when I came across the 30-Day challenge on Instagram, I signed right up thinking it would be a great addition to my month's schedule. The challenge consists of four weeks of total body circuit workouts consisting of 7 exercises that you perform for 1 minute each, with 15-30 seconds of rest between moves. Each exercise engages multiple muscle groups, all while using no equipment other than your own body. The circuit is repeated 2-5 times with 1 minute of rest between circuits, 3-5 times per week. The core workout moves are introduced in week 1, with each following week modifying and building on the core moves to increase the difficulty level. To be honest, when I committed to do this challenge, I didn't realize how long and difficult even the non-cardio intense Blogilates workout days would be, or factor in any rest days. I've only been able to do this circuit about 2 times a week, so I am definitely not getting a full effect. I might repeat a few weeks after the month is over, but here is my take so far. Instruction quality: The instruction in both the video and the PDFs are clear and easy to follow. I really like that the video includes both an instructor and a model, and the flexibility of having the PDF to take with you. Ease of use: I love that there is no equipment required for any of the moves, which means I can do this workout from the comfort of my living room. The moves are all pretty easy to pick up with the quality instruction, and having the PDFs makes it easy to do this workout anywhere. Time commitment: Going through the circuit 3 times only takes a little over 30 minutes, depending on rest time. Adding this to the hour plus Blogilates workouts has been challenging, but on its own I think the time commitment would be perfect for me. Communications: Bree, aka The Betty Rocker sends out fantastic emails each week with motivational exercises, helpful tips and recipes. She also has a great social media presence with several hashtags you can use to follow along on Instagram and Twitter. Intensity: Weeks 1 and 2 were a little low intensity for me, making it hard for me to burn the amount of calories I am used to in a hiit workout without going through the circuit 4 or 5 times. The intensity really picked up in Weeks 2 and 4 though, so this wasn't a real issue for me. Variety: Although the moves all work multiple muscle groups, after doing the Blogilates calendar I think I would miss doing other forms of cardio, pilates, and weighted strength training if this was the only workout I was doing. Completing this challenge has been hard for me because I am following the Blogilates calendar (and playing in doubles tournaments on weekends, playing in a volleyball rec league, and taking swim classes. But who's counting?). I also felt like the first weeks were a little low intensity for me since I had done a lot of hiit, and while you can up the intensity with less rest and more reps, this took more time than I was able to invest. 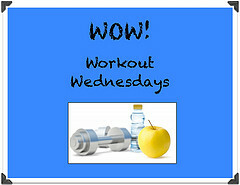 However, I loved the Weeks 3 and 4 workouts and will probably continue to incorporate them after the challenge is over. I would highly recommend signing up for the next challenge to any hiit newbies, or to people who are more experienced and want to combine the challenge with other workouts. 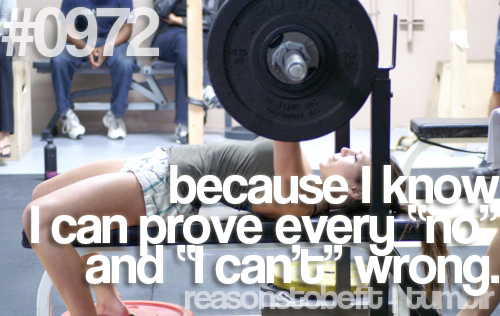 Q: What workouts have you been loving lately? Are you a monthly challenge type of person or do you like to do your own thing? To celebrate the bf's return, I decided to make a slightly more involved dinner than usual for meatless Monday. I really love meat (steak is one of the few things I'll run for! ), but I also understand the health and environmental benefits of eating lower on the food chain. So I've been giving meatless Mondays a try and have really enjoyed it so far. 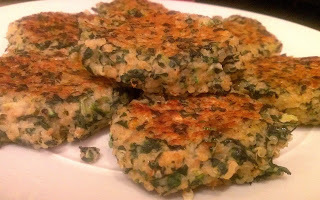 I had a lot of quinoa leftover from last week's meal prep, so I decided to give SkinnyTaste's Quinoa Patties a try, with a couple tweaks. Mix all ingredients except for the olive oil together in a large bowl. The dough will be pretty moist but will hold together. Heat a large non stick skillet and then add half the olive oil. 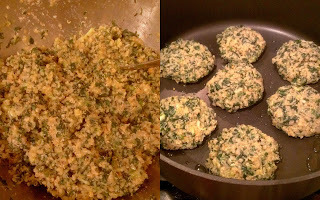 Form dough into fist sized patties and cook covered on medium low heat for about 8 minutes on each side. When the cakes are done, they will be crispy and brown on each side. This recipe made 12 cakes which is A LOT when there are only two of us eating them. Each cake has only 144 calories, and two of them were pretty filling. My meat-loving bf will often add bacon or some other meat to his "meatless" Monday meals, but he said he was totally fine with no meat with this recipe! To add a little more texture and flavor to the meal, I decided to serve these spinach chips I found on Pinterest a try. The chips were really easy to make. 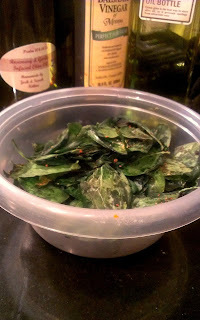 I just tossed about 2 cups of spinach, 1 tbsp of olive oil, and some garlic powder and Mrs. Dash in a bowl and baked in the oven on 325 for about 10 minutes. The flavor on these chips was really great, and they added some crunch to this dish. I don't know if I would really call them "chips" though. They are so light it's kind of like eating crispy air, and I need a little more substantial crunch in my chip substitutes. I do think they'll be great added to main dishes and maybe as a salad topping though. Q: Do you do "meatless Mondays"? Or is it all veg or all meat all the time for you? 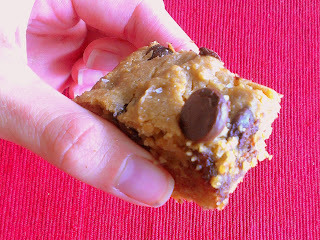 I have alternate Fridays off for the summer and decided to use the day to try the latest skinny treat craze: chickpea blondies. Chickpeas in dessert sounds completely crazy to me, but all the instagram and pinterest pics (check out these from @missk_j6) looked so good that I decided to give it a go. I based my recipe on this great post from Ambitious Kitchen, with a few modifications since I didn't need it to be vegan (plus I was been missing some ingredients and MAY have been too lazy to go to the store). Preheat oven to 350 degrees and grease a brownie pan. I used a 8x6 pan but 8x8 is probably better. 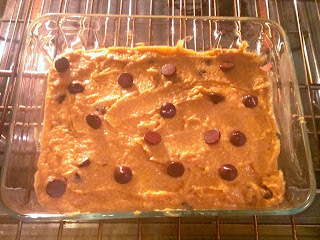 Mix all ingredients except for the chocolate chips and sea salt in a food processor and blend until smooth. Mine is small so I had to do it in two batches. At this point I tasted the batter and it was a little bean-y tasting but not horrible. So far so good. 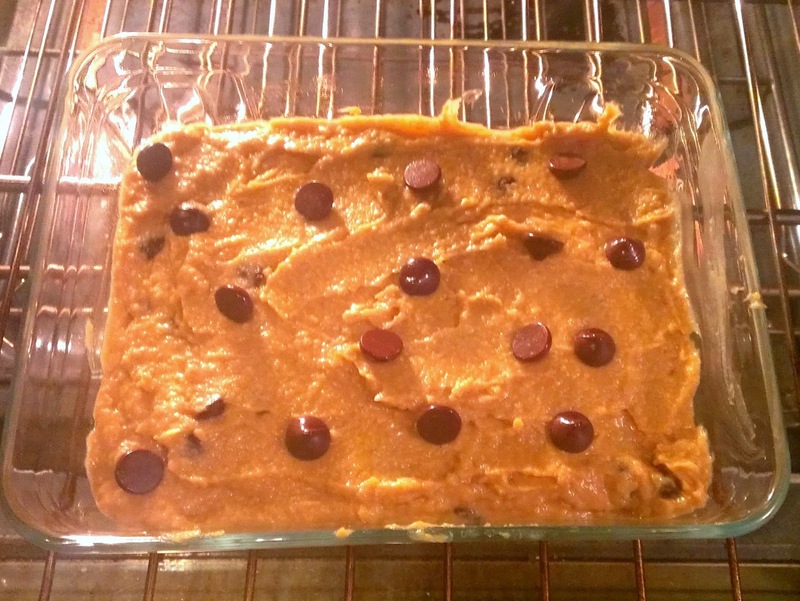 Mix 1/3 cup of the chocolate chips into your batter and then spread it evenly into your greased pan. Next, sprinkle the remaining chocolate chips over top of the batter. The batter is very sticky so this step was a little messy. Bake for 30 minutes or until the edges are slightly brown. Figuring out when the blondies were done was the hardest part of the recipe for me since baking them too long reportedly turns them hard. When I pulled mine out the center was still fairly squishy, but didn't feel like it was still liquid. 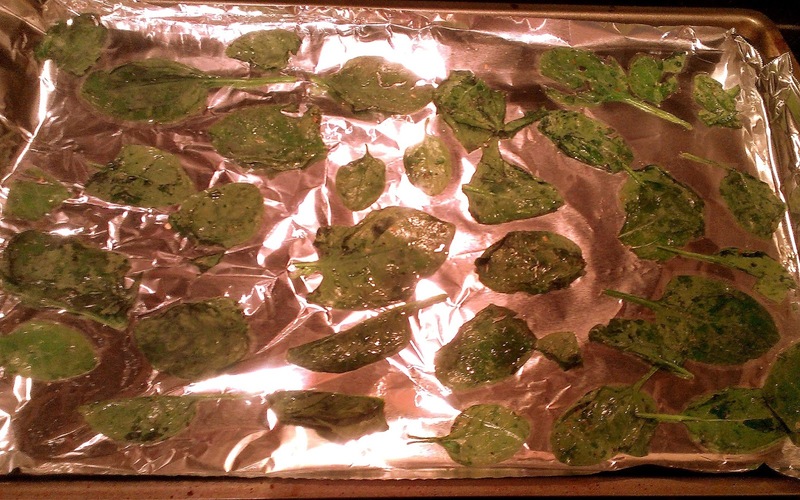 Let cool for at least 20 minutes, sprinkle with sea salt, slice into 16 squares, and enjoy! Despite being a predominately chickpea-based dessert, these are pretty tasty! The chickpeas aren't overwhelming, the texture is good, and I don't miss the flour. They are, however, a little salty for my taste. Next time I might skip the sea salt all together and would probably add more honey instead of applesauce to up the sweetness. But overall, definitely a pretty tasty treat that won't derail your fitness goals at only 120 calories a piece. 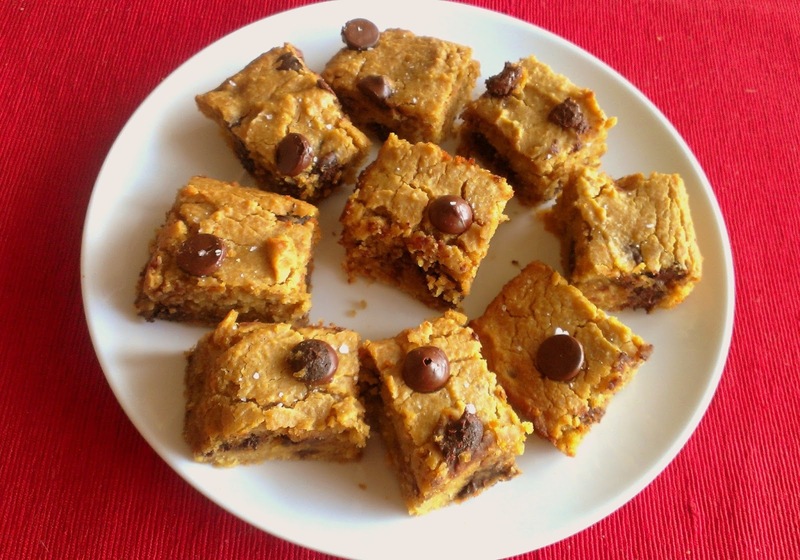 Q: Have you gotten on the chickpea blondies bandwagon? What's the craziest ingredient you've ever used in a dessert? Since so far on the blog I've mostly focused on food (don't I always?) I thought today I would talk a little bit about the latest workouts I have been using to meet my fitness goals. I have always been fairly active. I played volleyball growing up and in college and still enjoy working out now. My main exercise issue has been consistency. I might have a flag football game Saturday, play in a doubles tournament all day Sunday, do some Nike Training Club strength routines Monday, and then not work out at all the next week. I also tend to get bored easily and want to try every cool new fitness trend, which has made it difficult to stick with a workout program. 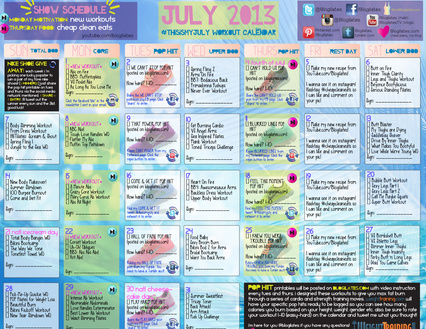 To combat this tendency, I decided to commit to and stick to a workout calendar for the whole month of July. 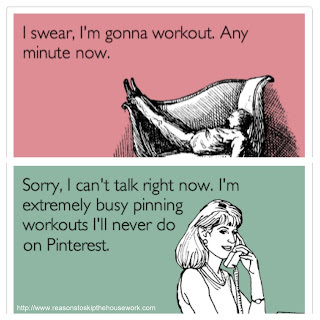 Well, I actually committed to two of them (that whole attention span thing). So far this has made a big difference for me so I thought I'd share how it's been going now that I'm about half way through. 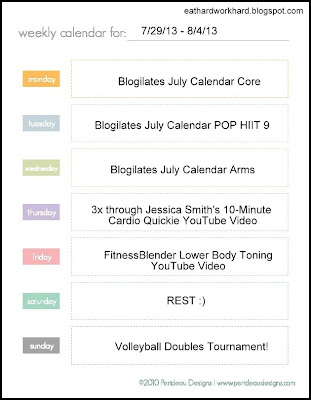 The first monthly challenge I set for myself was to complete the Blogilates July workout calendar. I'm not gonna lie, I was not an instant Cassey Ho fan. I've never been into instructors that talk through workouts, and Cassey talks A LOT about random things. She is also extremely high energy, which was a little hard for me to get used to. However, she also has TONS of hard workout videos available for free, and as a fitness instructor she really knows her stuff. 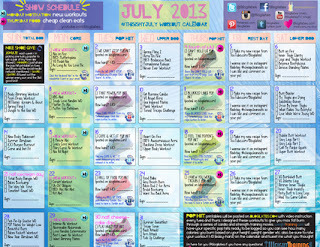 For July, Cassey put together a great calendar of 6 days a week of workouts, which are around an hour long each. There is great workout variety in the calendar, with Sunday focused on total body toning, Monday on core, Wednesday on upper body, Saturday on lower body, and Tuesday and Thursday on cardio. The calendar is really easy to follow, as all the workouts are posted together on a playlist for that day and all you have to do is press play. Variety: Like I mentioned, Cassey has a HUGE collection of YouTube workout videos. This means that, by the middle of week 3, very few of the videos have repeated at all, really helped to beat boredom and hold my short workout attention span. Balance: There is a really good mixture of strength, flexibility, balance, and cardio moves, which makes me feel like I am getting a much more complete workout than I could on my own. Community: Cassey has a large following and does a great job of interacting with her followers through social media. Seeing what other Blogilates fans is motivating, and it is great to have the community's support. Time commitment: Some of the playlists are looong. An hour a day is a big time commitment for me, and sometimes the day's workouts take over an hour. Workout intensity: Because of the great variety and balance of exercises, each day varies in intensity and calorie burn. Not a huge issue, but it is hard to spend over an hour burning relatively few calories. Sticking to this calendar has been relatively easy and has increased the consistency, variety, and balance of my workouts. I can already see changes in my core strength and muscle definition. The new HIIT routines (my favorite part!) burn a ton of calories and I can see repeating them after the month is over. While this calendar is a pretty big time commitment, I think it has been worth it and I would highly recommend giving it a go! 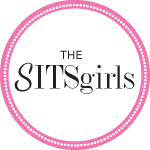 To access the calendar, click here and sign up for the Blogilates newsletter to get the password. Stay tuned next week for a look at my other monthly commitment, The Betty Rocker 30-Day Bodyweight Challenge. I've never been one of those people who have it together enough to prep a whole week's worth of meals at once. I have found, however, that a little bit of preparation at the beginning of the week really makes a difference in my eating choices, especially where breakfast and lunch are concerned. Here's my current formula for having healthy (and wallet friendly!) food ready on those days when I hit snooze one too many times before running out the door. I'm always running late in the morning, so having a nutritious breakfast that I can take with me to work is really important for starting my day off right. 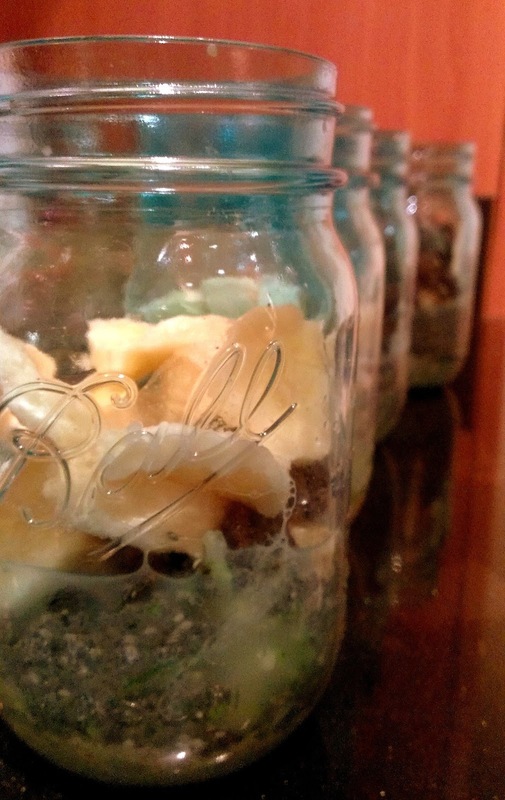 One of my favorite grab and go breakfasts is overnight oats. Mix everything in the mason jar, refrigerate overnight, and eat a great breakfast when you get to work the next morning. I love eating a big breakfast to stay full and avoid snacking until lunch. I like to prep one neutral protein I can eat all week in different meals. Last week, I made slow cooker shredded chicken. This week, I decided to try turkey meatloaf muffins. I used The Fitnessista's recipe for inspiration, but added a cup of grated zucchini and an extra quarter cup of oats to stretch my mixture into 16 mini muffins. 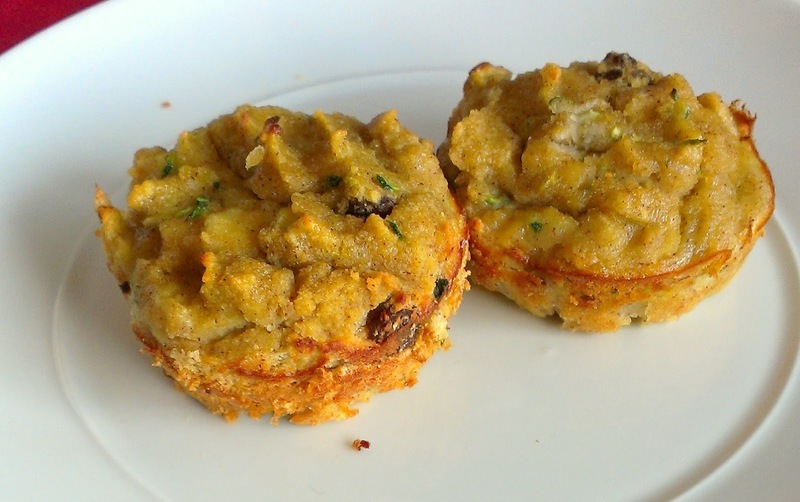 With the modifications, each muffin ended up being only 80 calories! I don't have the patience to prep all the ingredients for every meal at once, so I like to prep a few nutritious side items with fairly neutral flavors that I can use in a lot of different ways. 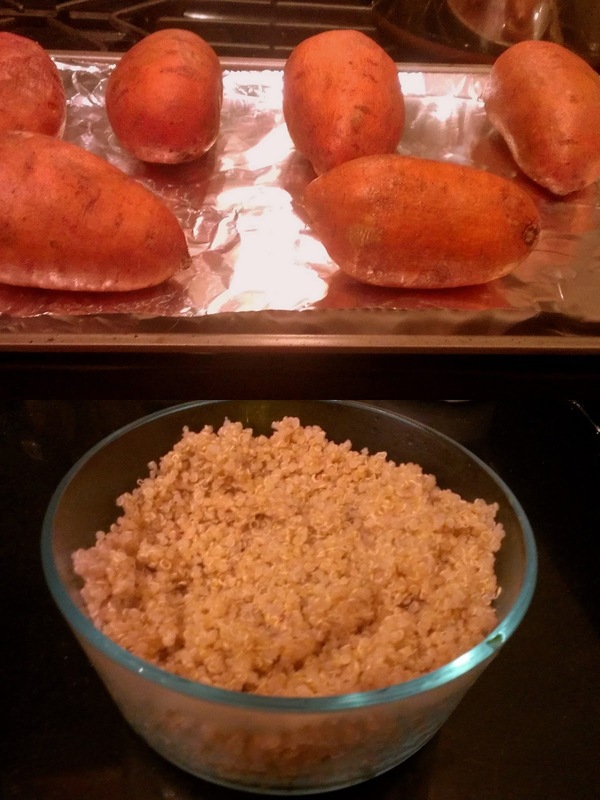 This week, I baked six sweet potatoes and cooked a huge pot of quinoa. I'm on a huge sweet potato kick right now! In addition to the above items, I also make sure to pick up a bunch of fresh produce at the grocery store to complete my recipes and eat for healthy snacks throughout the week. All in all the whole process probably took me less than an hour of active cooking, with another hour or so doing other errands while things baked or simmered on the stove. Pretty simple and it works for me. On Saturday, a couple girlfriends and I got together for a pool potluck party. I love potlucks, but get really stressed out thinking about all the delicious cheeseburgers, potato salad, and cupcakes (especially the cupcakes!) I have to resist over indulging in. Luckily, my friends are super supportive so we decided to make our party skinny AND delicious. 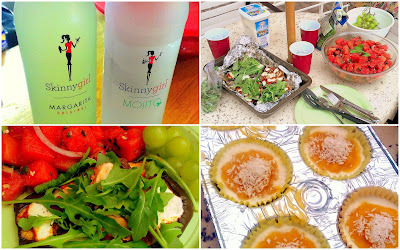 On the menu: Skinnygirl margaritas and mojitos, Paula Deen's watermelon salad (with about 1/4 of the amount of olive oil and the feta on the side), eggplant pizza from Balanced Spoon, grapes, spinach, and my skinny and delicious mango coconut cupcakes. 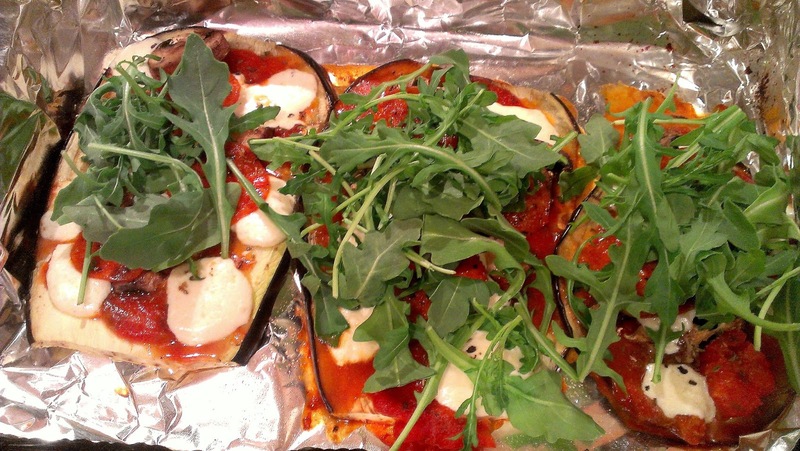 I contributed the eggplant pizzas and the cupcakes and prepped both the night before. 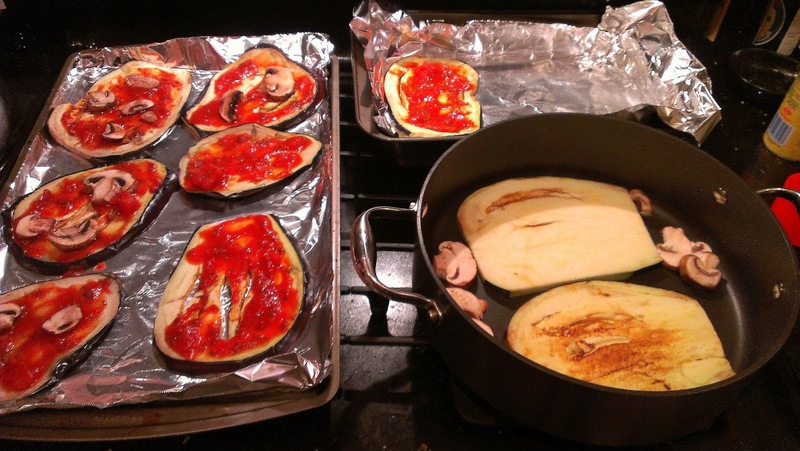 The eggplant came together super easily using Balanced Spoon's instructions. 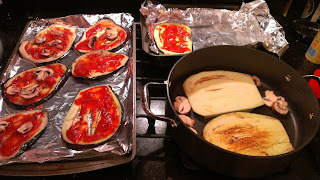 I just sliced the eggplant, browned on the stove along with some baby portabello mushrooms in a nonstick pan sprayed with nonstick spray, topped each slice with tomato sauce, fresh mozzarella, and the mushrooms and popped in the oven for 5 minutes. After removing the pizza from the oven, I topped with arugula. So delicious! I came up with the idea for the cupcakes after seeing these incredicle popsicles from Skinnytaste.com. I thought the mango and coconut flavors would be perfect for a pool party, but didn't want to invest valuable cabinet space in our tiny kitchen on a popsicle mold. Then I saw these cute frozen cupcakes and decided to adapt the Skinnytaste recipe to cupcake form. 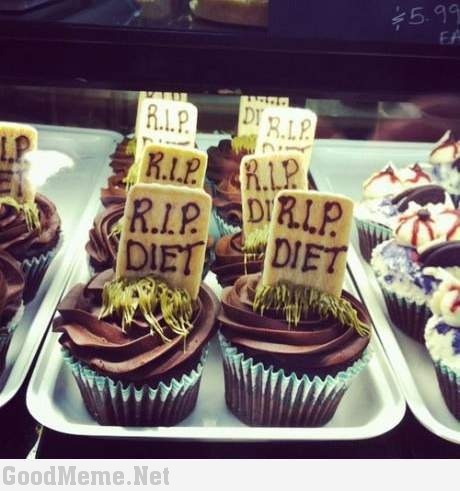 Also everything is more delicious in cupcake form! Mix the light coconut milk with the Greek yogurt and honey until thoroughly combined. Poor into cupcake liners until about 3/4 full. Blend the cubed mango and almond/coconut beverage and stevia in the blender until smooth. 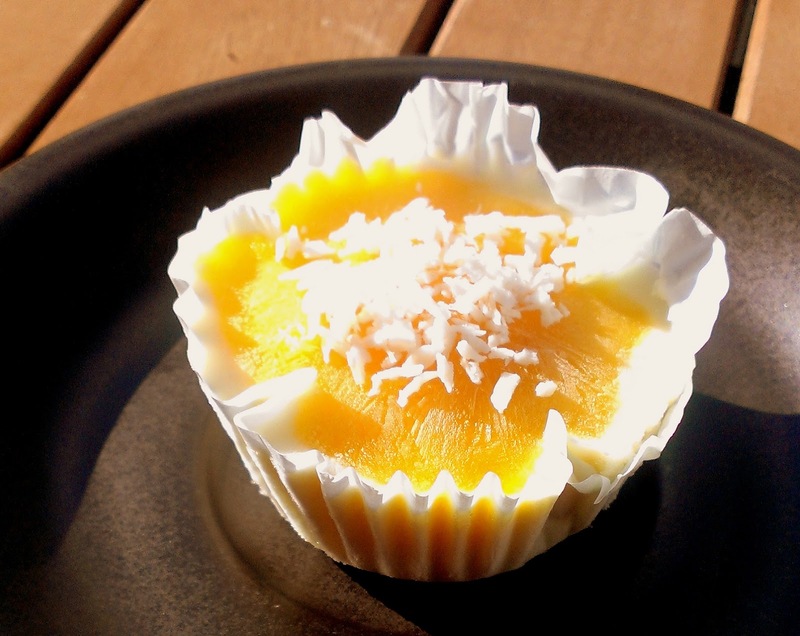 Scoop mango mixture into the center of the yogurt filled cupcake liners until full and only a small rim of yogurt is showing. Freeze overnight. 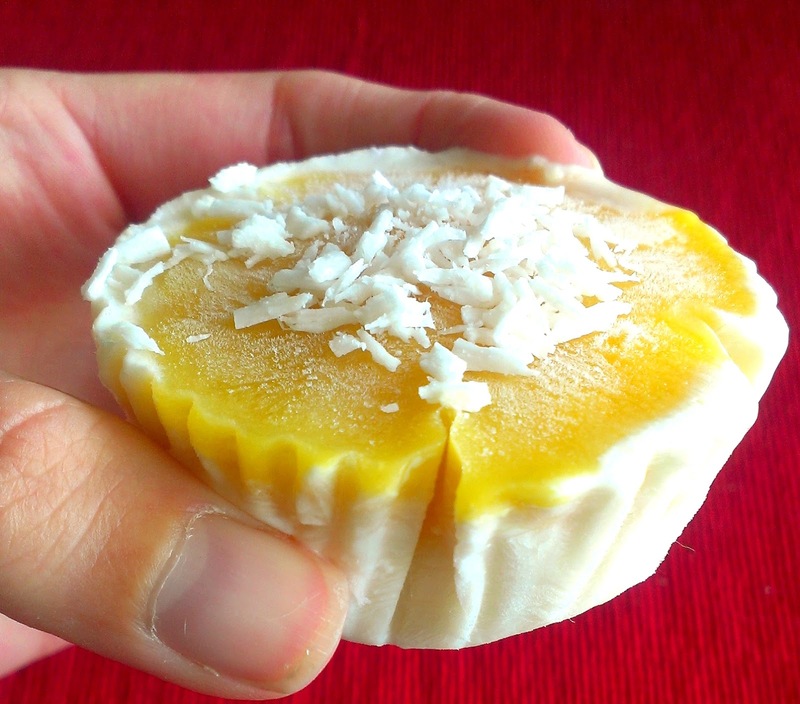 Top with coconut flakes before serving. I really like the way these came out. The mango and coconut flavors go really well together and the presentation is pretty cute if I say so myself. AND each cupcake comes in at about 51 calories! So what inspired me to finally start this blog months into my fitness journey? Cold. Hard. Cash. Over $25,000 to be exact. DietBet is a social-dieting game where players have 4 weeks to lose 4% of their body weight. Everyone puts money in the pot and weighs in at the start of the game. After four weeks, everyone who reaches their goal of losing 4% splits the pot. According to DietBet, 90% of people who participate lose weight. DietBet attributes this success rate in part to the proven effectiveness of financial rewards and penalties for producing weight loss (e.g. this study). This part of the site's theory of change makes perfect sense to me, as I have always found cash to be a great incentive and HATE the idea of losing or "wasting" money. However, DietBet contends that money isn't the only thing that makes the game work. According to the site, the power of social motivation is a big factor in user success. Publicly declaring your fitness goals ups the commitment, and friendly support or peer pressure can be as big an incentive as the cash payout. 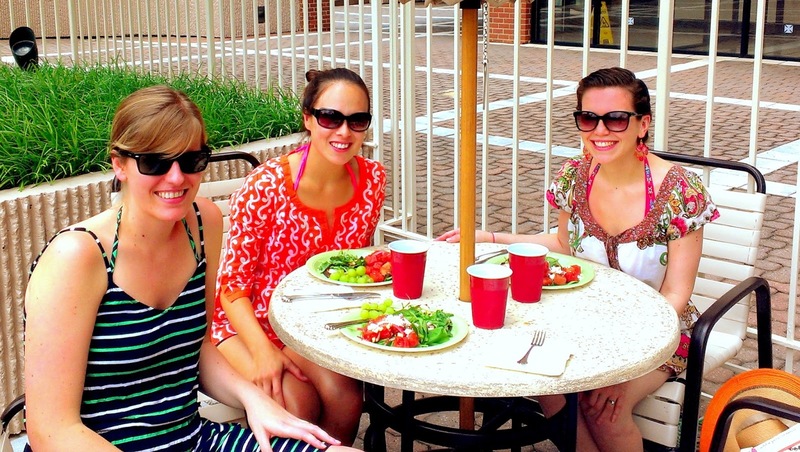 This was the part of DietBet (and of starting this blog) that terrified me, mostly because I feel there is a strong taboo against talking about weight loss and dieting publicly. When I was first starting my fitness journey, I got a surprising amount of negative reactions from friends who told me I was "crazy" to want to lose weight, that I had self confidence "issues", and that I should focus on working on my body image "problems" instead. For the record, my ultimate aim is definitely more about increasing my fitness level, living a healthy lifestyle, and just feeling great in my own skin than about the numbers on the scale. However, as long as it is done in a healthy way, I do think that these numbers can be used to measure progress and set goals, and it is OK to talk about weight loss. I first heard about DietBet thanks to the fabulous Cassey Ho of Blogilates fame. I really wanted to join her June game, but held back out of fear of failure and of publicly declaring an intention to lose weight. And boy did I miss out. Cassey's game was the largest ever in the history of DietBet and had a combined pot of almost $150,000! So when July came around I decided to take the plunge and join a game. I now have a total of $50 down in two games that I will lose 5.5 pounds by August 6. This seems extremely ambitious and somewhat daunting to me (it took me over 3 months to lose 10 pounds), but I feel extremely motivated and in-charge of my own destiny. And, no matter what happens, I am proud of myself for getting over my fear and just trying. Q: Have any of you tried a DietBet? 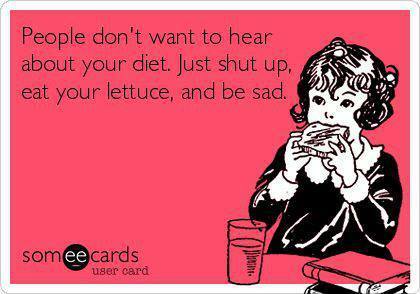 What are your thoughts on dieting publicly? If I had been more on top of things I would have started this blog when I started my health and fitness journey almost five months ago. Why the hold up? To be honest, the whole blog thing really scared me. What if I didn't have anything to say? Worse, what if everything I said was stupid, boring, or just plain not good. Fear of falling short of perfection held me back from even getting started. Then I remembered that no one except for my mom would probably be reading this. And THEN I remembered that my mom doesn't even know what blogger is and finally decided to just go for it.